OCT is the inspection which photos the fault picture of the retina. 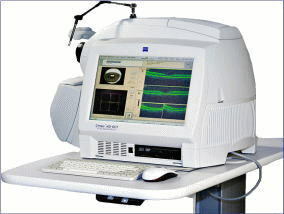 This is the latest apparatus exceeding OCT2000 which is a former type, or OCT3000, and serves as measurement apparatus which was markedly alike and progressed rather than old OCT.
Old OCT was the method of using the measurement principle "Time domain", measuring the sectional view of an eye little by little over about about 1 minute, and taking data. However, a lot of data can be measured now by invention of the technology of the "Spectral domain" developed newly in a short time. It measures the sectional view of an eye at a stretch with the speed for 5 or less seconds, and also it not only takes the data of a section, but is made the solid of 3D, and analysis also came made. In former type Time domain, since an inspection took long time, the small motion of eyes,etc. There was a limitation also in the quantity of the information collected. However, by using the Spectral domain, a lot of information can be collected now in a short time, ease the patient’s burden, and inspection accuracy also improved. By this OCT inspection, only by medical examination, the state of the unclear retina can be clarified and it can use for the determination of a treatment policy to the illness of the retina, and the judgment of a curative effect. As for the typical disease which needs OCT, the disease of Age-related macular degeneration, Epiretinal macular membrane , a Macular hole, etc. is mentioned. An OCT inspection is effective also in order to carry out early detection of these macular diseases and retina diseases. 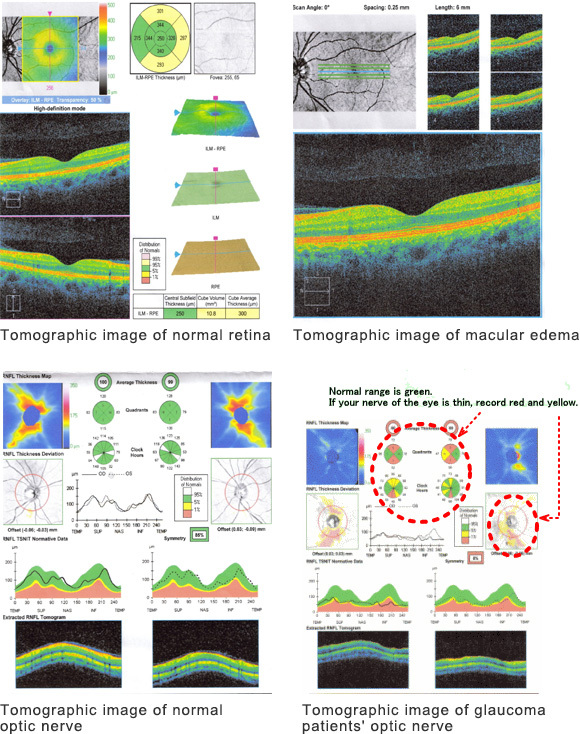 Moreover, since the fault picture of an optic nerve and a retinal nerve fiber layer can also take a picture, before the condition which a view lacks appears, the deficit of the retina optic layer by glaucoma can be caught. 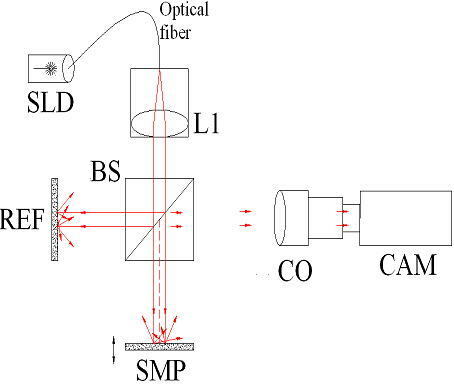 The principle OCT is low coherence interferometry. Light is split into and recombined from reference and sample arm, respectively. In a glaucoma inspection, we will measure the thickness of the optic layer in the inner part of your eye. Compared with a normal person, it can be analyzed “which is thin” and “which illness to follow”, and glaucoma can be judged by inspecting in several steps. The retina is equivalent to the film of a camera, and the light from outside passes along the vitreous body of a pupil, a lens, strikes upon the retina, and sence light. Since there is pigment called xanthophyll in a macular abundantly, yellow is carried out. In the film and the retina of a camera, it may differ greatly. Although any portion may be sufficient and it is reflected with the film of a camera, and eyesight with the very sufficient retina at the center of macular is acquired, in the other place, sufficiently good eyesight is not acquired by a normal eye, either. Although a macular is a very small portion, eyesight declines remarkably, and it becomes impossible therefore, to update a driver’s license or to read a character, even if there are no abnormalities in the retina in addition to it, when the obstacle of the macular is carried out. A macula in the center of the retina become senescent, and new blood vessel grows under the retina when a waste material is accumulated and happens blurred vision by break down visual cells and the bleeding of the visual cell. A vitreous body touch with macula transforms it by changes that occur with age. 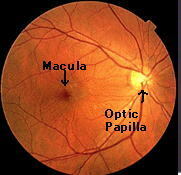 Also, a hole is a disease to open on retina by pulling macula area for the center of the retina. Because there is a hole in the center as a symptom, If your eye field is lacking or get distorted. The state that a film formed on the macular surface is epiretinal macular membrane. Denaturation happens to the vitreous body that a lot of things by the aging occupy most in eyes and may stay to the macula when a vitreous body leaves the retina. It thickens and becomes epiretinal macular membrane. It may be caused by inflammation in eyes including other injuries, uveitis. There may not be subjective symptoms, but the collar which it is warped by the thickness of the film which formed on the macula, shrinkage condition, and was seen may become hard to be seen. Glaucoma is a leading cause of blindness. Glaucoma can cause blindness if it is left untreated. And unfortunately approximately 10% of people with glaucoma who receive proper treatment still experience loss of vision. With medication and/or surgery, it is possible to halt further loss of vision caused by glaucoma. Since glaucoma is a chronic condition, it must be monitored for life. Everyone is at risk for glaucoma from babies to senior citizens. Older people are risk for glaucoma but babies can be born with glaucoma (approximately 1 out of every 10,000 babies born in the United States). Young adults can get glaucoma, too. African-Americans in particular are susceptible at a younger age. There may be no symptoms to warn you about Glaucoma, since usually no pain is associatetd with increased eye pressure. With the most common form called open angle glaucoma, there are virtually no symptoms.Vision loss begins with peripheral or side vision. You may compensate for this unconsciously by turning your head to the side, and may not notice anything until significant vision is lost. The best way to protect your sight from glaucoma is to get tested. If you have glaucoma, treatment can begin immediately.